In Jason Chuen's views, 3D printing technology is going to transform medicine. It sounds like something out of Frankenstein, but could we eventually 3D print human organs? Not exactly, says Chuen. But he’s convinced that in the future we will be able to 3D print human tissue structures that can perform the basic functions of an organ, replacing the need for some transplants. The problem, says Chuen, is that once inside the gel, cells can die in a matter of minutes. This isn’t a problem for small structures like organoids that can be built quickly and then transferred back into a nutrient solution. But it is a problem when attempting to make something larger like an organ because the initial layers of cells will die before the organ is completed. “Unless there is some breakthrough that enables us to keep the cells alive while we print them, then I think printing a full human organ will remain impossible. But where there is potential is in working out how to reliably build organoids or components that we could then bind together to make them function like an organ,” says Chuen. People suffering from a range of ailments, such as the elderly, are often dependent on taking multiple pills throughout the day. But imagine if one pill could replace the ten pills your doctor has prescribed? According to Chuen, 3D printing is on the way to making this possible, opening up a whole new world of customized medicines. Rather than simply embedding a single drug in a pill that is designed to dissolve and release the drug at a set time, the precision of 3D printing means pills can be designed to house several drugs, all with different release times. A 3D printed “polypill” that contains three different drugs has already been developed for patients with diabetes and hypertension. 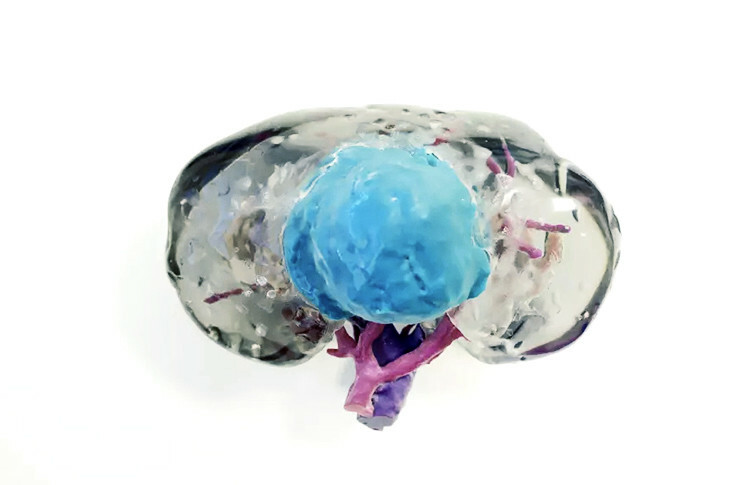 Studies of surgeons using 3D printed models to rehearse procedures have shown that operations can be completed faster and with less trauma for patients. The potential cost savings alone are considerable. As Chuenpoints out, running an operating theatre can cost AUD$2,000 an hour. That is over AUD$30 a minute. Chuen and Coles-Black themselves have begun printing out copies of patient kidneys to help surgeons at the Austin in planning the removal of kidney tumors. Such hard plastic models can be made more realistic by printing them in more expensive flexible material such as thermoplastic polyurethane. The material cost of the hard plastic aortas in Chuen’s office is about AUD$15 (less than $12 in the United States), whereas if printed in soft plastic the cost can rise to AUD$50 (less than $40 USD). 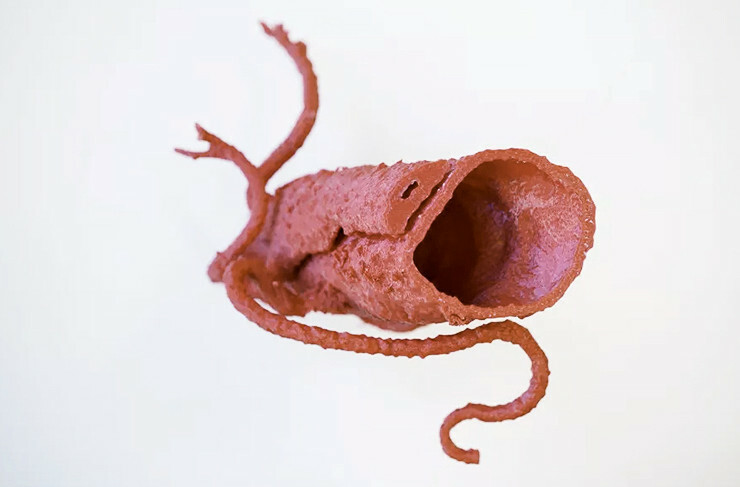 The real cost in 3D printing biological models is not just materials or printers, but also the software used to translate the scans into files for the printer. The 3D segmentation software Chuen uses costs about AUD$20,000 a year (under $16,000 USD). As soon as 3D printing began to take off people were quick to see the opportunity for creating amateur prosthetics for their pets—from puppies to geese, and even tortoises. Unlike for humans, there was no mass-supply chain of prosthetics for pets. But mass-supplied prosthetics are likely to be a thing of the past as 3D printing is increasingly used to manufacture prosthetics that are exactly tailored to a patient’s needs. “For example, with hip replacements, surgeons have to cut and ream a patient’s bone to fit the prosthetic, but in the future, it will be normal to 3D print a prosthetic to fit a patient,” says Chuen. Just as 3D printing is allowing customized production of medicines and devices, the production itself is likely to become localized. The warehouses that are full of packaged medicines and prosthetics will in the future likely be replaced by digital files of designs that hospitals and pharmacies will be able to download and print on demand using stored raw materials, says Chuen. Such distributed manufacturing, he says, could make medicines and devices more equitably available across the world so long as a local hospital for instance has the printing technology in place and access to raw materials. But for Chuen, the immediate overall challenge in medical 3D printing is ensuring that medical professionals themselves are up to speed with the technology because it is their clinical experience that will be needed to drive its successful application. “It is a revolutionary technology that will make medical care better and faster, and more personalized. But what we need is for more medical professionals to start exploring and experimenting with what this new technology can do, because many things that we thought of as impossible are now becoming possible. “I think we are moving towards a world where if you can imagine it, you will be able to print it—so we need to start imagining,” Chuen says.